Jane Austen's Pride and Prejudice is the most romantic novel of all time, according to a poll of authors of today's literary love stories. Pride and Prejudice, published in 1813, beat Charlotte Bronte's Jane Eyre in a survey of members of the 700-strong Romantic Novelists' Association. Gone With the Wind, Wuthering Heights and Rebecca were also in the top five. Meanwhile, Whitbread and Orange winner Andrea Levy has been nominated for the 2005 Romantic Novel of the Year Award. Of the books in the all-time poll, author Jenny Haddon of the Romantic Novelists' Association said: "This is the heartland of romantic fiction and these are novels that have stood the test of time." "The core of each story is what people risk when they fall in love and what it can cost. These authors lay it bare for us in a way that is as relevant today as when the books were first written." 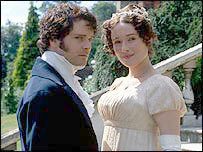 Jane Austen's Persuasion was at number seven in the list, while Daphne du Maurier also featured twice in the top 10. Rebecca was in fourth while Frenchman's Creek was at 10. The poll follows another recent survey in which listeners of BBC Radio 4 Woman's Hour voted Pride and Prejudice the book that has most changed the way women see themselves. On the 2005 shortlist for the association's Romantic Novel of the Year Award, Levy is in the running for her third major literary prize in a year. Her novel Small Island is up against works by Katharine Davies, Erica James, Susan Lewis, Elizabeth Noble and Cecilia Samartin. The winner of the £10,000 prize will be announced at a ceremony at the Savoy Hotel in London in April.